Architecturally, the historic alley structures in the Cherokee Triangle range from utilitarian frame structures to formal, brick buildings. As modes of transportation have changed from horse and carriage, to early automobiles, to large SUVs, the size and form of these service buildings have adapted. Historic outbuildings are an important part of the urban fabric and are considered contributing structures to the local preservation district. A walk down three alleys illustrates the character of these service roads. The alley between Willow and Bassett avenues provides an overview of frame outbuildings. At the corner at Longest Avenue, a two-story carriage house (pictured at top) features a cupola for ventilation, stall windows at the ground level, and large doors. Moving north, on the Willow side of the alley, a large two-story building (1297, pictured above) is more utilitarian. It represents one of the few remaining typical late-nineteenth-century alley outbuildings. Midway down the alley, a yellow structure (1291, above) shows how outbuildings grew and were joined. The resulting is an interesting roofline and a variety of siding and window types. Farther along the alley, there are two, modern two-level structures with garage below and living space above (1267, 1287). 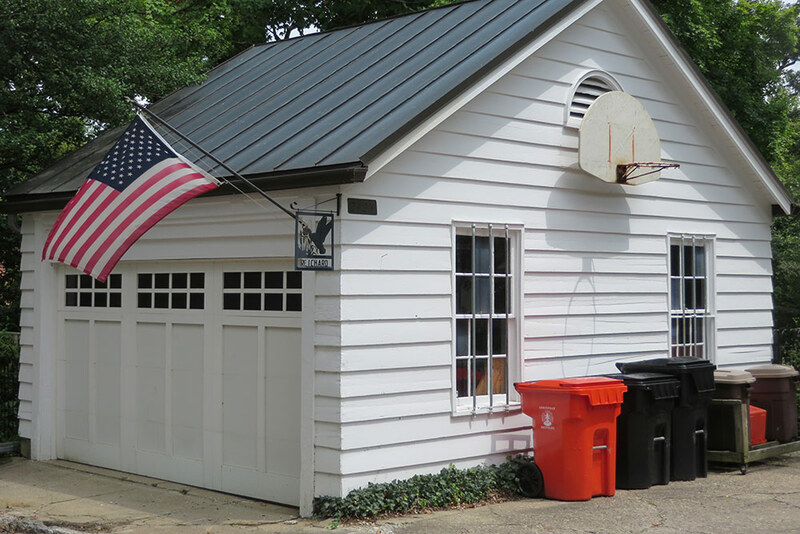 Between those two, there is even a carport converted to a garage (1275) using modern cement-fiber board and wood trim configured to resemble the board-and-batten exteriors of early stables. For good examples of brick outbuildings, take a walk along the alley between Cherokee Road and Everett Avenue. Here, there are large brick structures that were clearly designed for use in the days of the horse and carriage. Asymmetrical doors and windows were placed where needed for stalls. Doors at the second levels allowed for loading of hay. 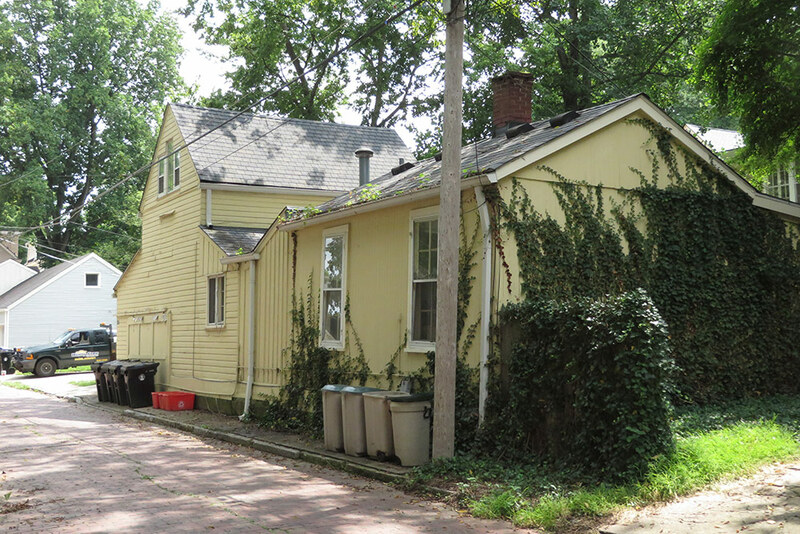 In some instances, outbuildings are brick at the ground level with another siding material such as stucco (1315, above) or shingles (1279, below) above. While these material changes provide architectural interest, the choice and placement of materials was primarily utilitarian. Sturdy masonry at the ground floor stood up to carriages and stable maintenance. Lighter, less expensive materials used above were not in danger of impact. 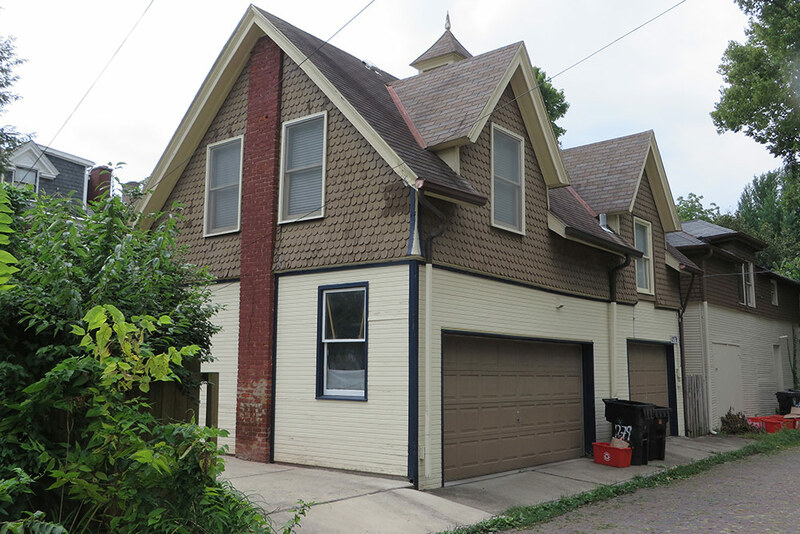 In the 1100 block, there are excellent examples of substantial carriage houses designed to coordinate with the main structures. One last alley worth a walk is Ridgeway Avenue, off Willow between Cherokee Parkway and Longest Avenue. Designed as more of a street than an alley, it is broad enough to allow two way traffic. It served as the main access to houses set high over main roads. Outbuildings on Ridgway were constructed later than those along Cherokee Road. 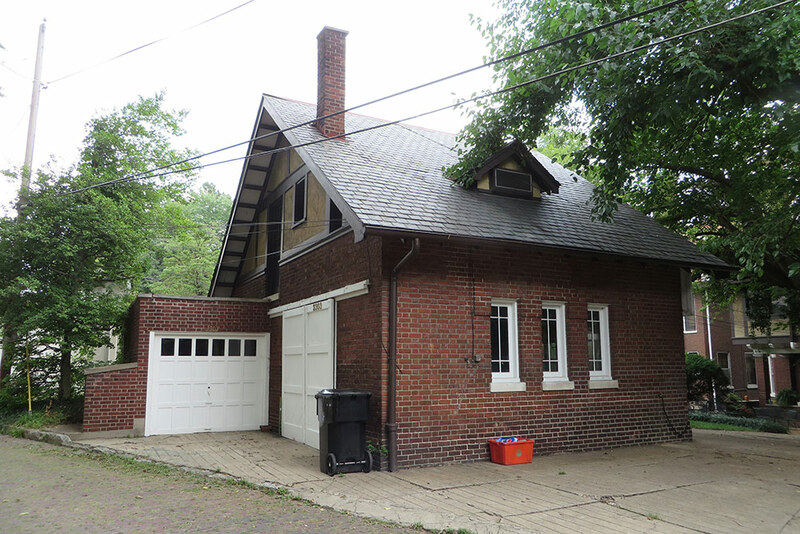 A large half-timbered, brick carriage house (2303, above) sits alongside smaller Arts & Crafts–era, one-story garages built to house newly popular cars. 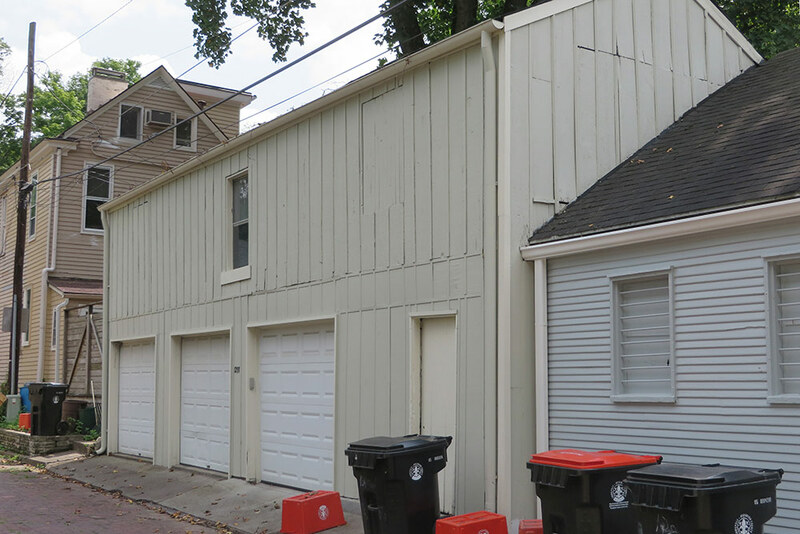 These utilitarian garages are finished in lapped (2425, below) and board-and-batten siding (2501) as well as stucco (2327, pictured at bottom). Some are designed with large overhangs and exposed rafter tails to resemble garden sheds. 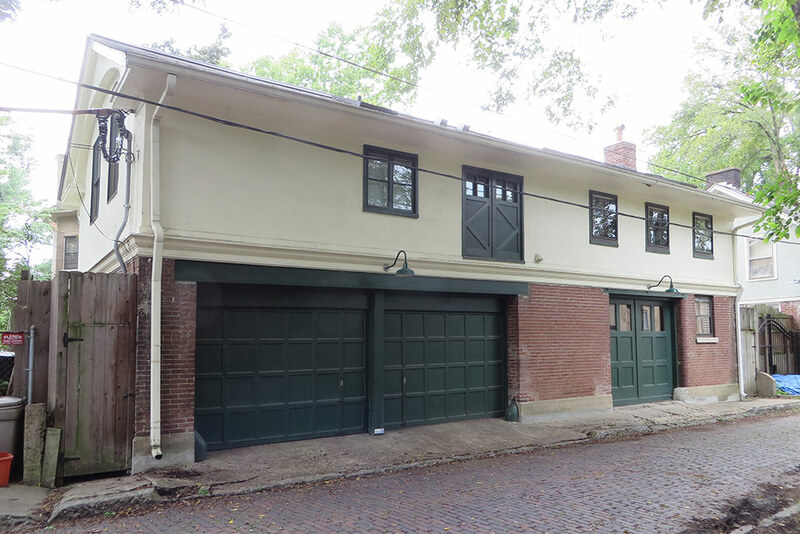 Care has been taken to detail overhead garage doors as carriage house doors (2325). Recent accessory structures reflect the high level of outbuilding design found on Ridgeway. Many of the early frame stable buildings deteriorated and have been removed. 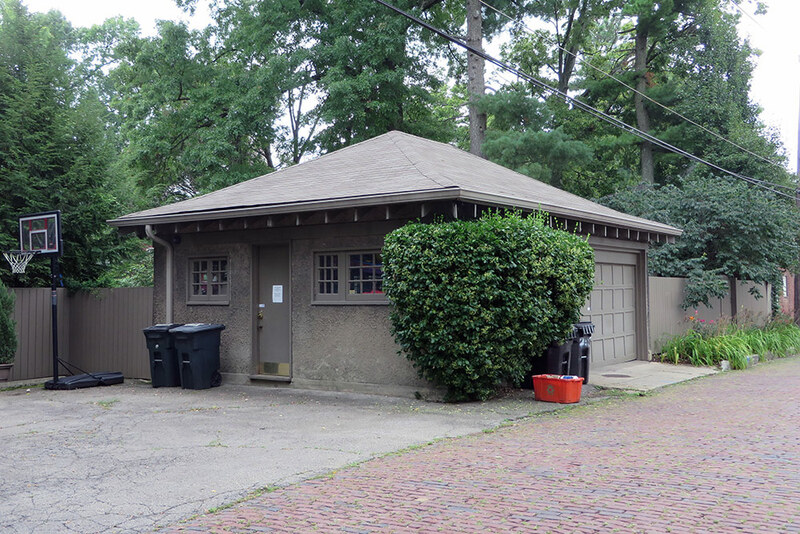 Recognizing that the experience of a historic neighborhood depends on more than just the main houses, the Cherokee Triangle Architectural Review Committee takes particular care in their review of new garages. Most recent structures utilize cement fiber board, a synthetic material with a longer life than plastic siding. Garage doors designed to resemble carriage house doors add visual interest. Dormers break up large roof planes and allow for dwelling or storage spaces at second levels. These design details pay homage to early outbuildings and enliven the alley experience. Take a walk and enjoy the variety! I love walking, biking and driving down all these alleys.